At DE CARO & KAPLEN, LLP, our mission is to improve the quality of life for persons with brain injury, their spouses and family members. We believe that the best cure for a brain injury is prevention. We are committed to assisting victims of brain injury. We are proud to sponsor and support the programs and activities of the Brain Injury Association of New York State and the Brain Injury Association of America. We take great pride in representing our clients with compassion and zeal to see that justice is done. 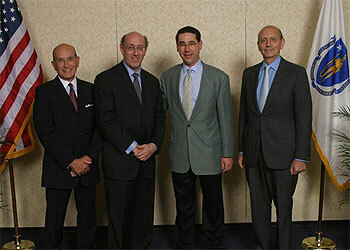 MICHAEL KAPLEN (second from right) receiving special recognition from Trial Lawyers Care President Richard Bieder, United States Special Master Kenneth Feinberg and Associate Justice of the United States Supreme Court Stephen Breyer for his volunteer achievements on behalf of the September 11th Victim Compensation Fund special catastrophic victim program.